Connect with those committed to making Atlantic Canada and the country a fairer and more sustainable place. 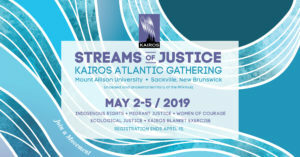 Whether you are new to activism and want to test the waters or are a long-time change-maker seeking to broaden your network and dive deeper into the issues that concern you, Streams of Justice: KAIROS Atlantic Gathering will provide a forum to learn, connect and transform. The Gathering will give us the chance to lay the groundwork for a working Atlantic justice web. The itinerary includes in-depth training in your choice area, hands-on skills development to use in any field, and understanding of core current issues, with time for socializing and networking with people from across the region. Register here by April 15. Having trouble deciding which stream? Bring friends and fellow activists and go home as a team with all the information. Check out the E1B2 Contest for team discounts and prizes. Migrant Justice Stream will include face-to-face conversation with migrant workers to learn the issues and challenges they face, the opportunity to celebrate successes in our joint advocacy, as well as an overview of current issues, including Human Trafficking and Forced Labour. Women of Courage Stream will delve into the Gendered Impacts of Resource Extraction in Canada and abroad with Dr. Sherry Pictou, Mount Saint Vincent University professor; Alma Brooks, Maliseet grandmother from the St. Mary’s First Nation; and Kelly Campo, human rights defender from Colombia. The second day will be dedicated to Women, Peace, and Security with Colombian partner Kelly Campo, and will explore the substantive contribution of women’s participation in peacebuilding in conflict-related situations. KAIROS Blanket Exercise Stream is reserved for those who already have some experience facilitating the exercise. It will include new professional development around health support and trauma, as well as instruction and hands-on learning about how to conduct an exercise with more than 100 participants. Come share expertise with facilitators from across the region. Ecological Justice Stream will guide discussions on local and national environmental issues through the lens of reconciliation. Learn how to re-connect with nature from guest speakers and meet others in the region who share your passions. We will work together to develop a network of environmental activists with specific advocacy goals. Indigenous Rights Stream has many important topics to consider. For example, Education for Reconciliation, which KAIROS has been working on since the Truth and Reconciliation Calls to Action were released includes lobbying Ministries across the country to include Indigenous content from K-12. The United Nations Declaration on the Rights of Indigenous Peoples and private members Bill C262, is an urgent issue right now, and we need folks across Canada to write letters to Senators via the kairoscanada.org website. Issues surrounding the inquiry on Missing and Murdered Indigenous Women and Girls and its inquiry, are impacting our communities and families in ways we need to understand more deeply. Learn from insiders, share your knowledge and develop next steps on Atlantic advocacy. If you can’t commit to three days, you may want to consider attending one or more of these three components of the Gathering which can be treated as stand-alone events. Keynote: KAIROS partner, Kelly Campo will discuss the power of arts in the Organización Femenina Popular (OFP)’s youth group in Colombia. Bring your memorabilia from a life of activism – T-shirts, posters, buttons, artwork…or send new or old photos to events@kairoscanada.org with the subject line: Arts & Activism to be part of a slideshow. DJ Gabriela Jimenez will prepare a playlist of activist songs. Send suggestions or requests to gjimenez@kairoscanada.org. Join us for the largest Blanket Exercise ever in Atlantic Canada! The KAIROS Blanket Exercise is a visual and experiential way to represent colonization in Canada and its impact on Indigenous peoples. This really big Blanket Exercise is a coming together of hearts and minds in a collective commitment to build reconciliation based on justice for Indigenous peoples. Elder opening and special guests. All are welcome! Share on Facebook and let us know you are coming.